Christopher Piccozzi, Brian Sherman, Sean Patrick and Kevin Springer, Donna Lee, Peter Sessa Sr., Michael Russo, Ed Morris, Vera MacDonald and Tyrus Runyon on February 24; Amber Jernick, David M. Williams, John Ingianni, Laurene H. Silvani, Sarah Evangelista and Jeri Lynn Hoover on February 25; Jim Theinert, Rosemund Douglass and Janina Spotteck on February 26; Georgiana Ketcham, Phil Mancine, John Dudley, Katy Binder and Hope Kanarvogel on February 27; Benjamin James Nowikas, Grace Kaminsky, Will Anderson Jr., Tom Mysliborski Jr., Helen Mysliborski, Steve McLaughlin Jr., Don Forchelli Jr. and Vanessa Hamblet on February 28; and Benjamin Stacey Clark, Kristian Clark, James “Harvey” Cowen, Casey Brianna Burgess, Madigan Teodoru and Emma Woodworth on March 1. Keith Schutz, Prudence Fairweather and Richard Loper on February 17; Terry Hickey, Willette Hoffmann, Douglas Halsey Jr., Christopher Parsons, Kate Saetta, Jonathon Rivera, Yvonne Loinig and Alex Graffagnino on February 18; Michael Ryan, Sean Cronin and Wil Sherman on February 19; Steve Nathan, Kimberly Hallman Clark, JoAnne Biegert, Jaime Lenzer, Nicholas Young and Derek Brockbank on February 20; Rick Dalton, Valerie Halsey Wettengel, Megan Ames and Kurt Bollmann on February 21; Eleanor P. Labrozzi, Jeanne Farnan, Sheila McGayhey, Kelli Morgan Sipperell, Adam Walz, Katrina Kimberly Adams, Fiona Aitken and Emily, John and Joel Hallman on February 22; and Barbara Sanwald Smith, Michael Pollio and Alison Binder on February 23. Tori and Hankins Parichabutr on February 17 and Kathy and Ted Sullivan on February 20. By the Shelter Island School “Challenge” team last week. They were paired with East Islip High School on the popular student quiz show on Channel 14 but faced a team drawn from a graduating class of 400. No contest but it took a lot of heart and courage to try. Amanda Clark, this summer’s 2012 Olympic contender in the women’s 470 races, received the US Sailing Team AlphaGraphics Commercial Award at a dinner last month in Miami, Florida — presented to the athlete who has been outstanding in supporting the commercial and sponsorship activities of the US Sailing Team. “Whenever we have a speaking engagement or appearance, Amanda is 100 percent reliable to knock the socks off any corporate executive,” a USSTAG manager said at the awards program. 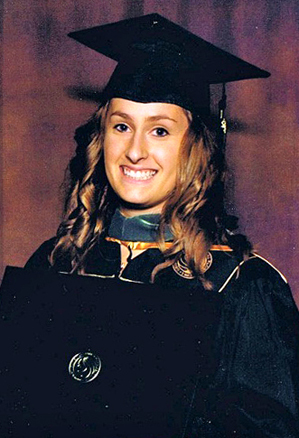 Cristina Vecchio, who received a Master of Arts degree in Communication Sciences and Disorders from the University of Central Florida on December 16, 2011. Cristina is a 2009 graduate of Purdue University and graduated from Shelter Island High School with the Class of 2005. She is currently completing her clinical fellowship in speech language pathology with Banner Health in Phoenix, Arizona and will be receiving her Certificate of Clinical Competence from the American Speech-Language Hearing Association. Cristina is the daughter of Frank and Deborah Vecchio of Shelter Island and the sister of Nick and Stephanie Vecchio. Marissa Iacono, who has earned Dean’s List honors at the University of New Hampshire’s Whittemore School of Business and Economics for the fall semester. Marissa was also invited to join the university’s Golden Key International Honour Society. Dottie Bloom, Lorie Ferrer Plock, Paul Brewer, Jimmy Gereghty Jr., Karen Bennett Edwards, Karen Dubno, Ella Petry and Kathryn Cogan on February 10; Jerry Card, Carol Davella and Sue Klenawicus on February 11; Les Larsen, Tom Young, Leona Byington, Verne Fuller, Elizabeth Ann Lechmanski, Dave Huschle, Aiden Hansen and Teri Richards on February 12; Sandra Arthur, Alice Ann Ryan, Judy Card and Nicole DeMarsico on February 13; Ned Radovic, Jean Dawson and Jennifer Yourdon on February 14; Robert Alan Mundy, Vivienne Ganter Ritz, Christina Ritzler and Marge Card on February 15; and Laura Jean Tuthill Needham, Judy Hoffman, Jack Savage and Sean Michael Hill on February 16. Cindi and Phil Mancine and Don and Ellen Kornrumpf on February 10; Judy and Jay Card on February 11; and Barbara and Jim Reeves on February 15. Leo Urban Jr., Stephanie Tybaert, Matthew Spahn, Jim Reeves and Elizabeth Lenox on February 3; Diane Gibbs Brayer, Donna Huber, Jessica Sherman, George Chimenti and Karyn Reeves on February 5; Susan Bartilucci, Cynthia Santillo, Fritz von Carp, Kelly Losito, Julia and Lauren Williamson, Capt. Bill Hansen and Jacob Reeves on February 6; Bob Raiber and Kari Larsen Pedone on February 7; Stacy Scudder, Tommy Ryan, Erin Lee, Jimmy Richardson, Cassandra Marshall, Madeline and Juliana Mitchell and Hoot Sherman on February 8; and Toots Clark, Bambi Ames and Jack Clary on February 9. Sharon and Ralph Kast on February 4. Morgan Waddington, who earned a place on the Dean’s List for the fall semester at Tulane University’s Newcomb-Tulane College in New Orleans. Morgan graduated from the Shelter Island School with the Class of 2009 and was the class valedictorian. 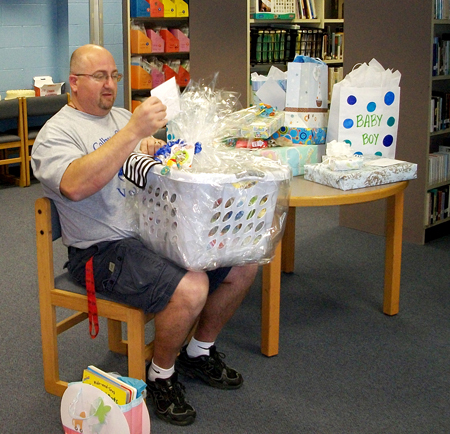 JANINE MAHONEY PHOTO | Physical education teacher Brian Becker opens gifts for baby Becker at the shower given to him by the Shelter Island Faculty Association. Baby Boy Becker’s anticipated arrival at the end of this month was celebrated on January 18 in the school library, hosted by the Shelter Island Faculty Association. The occasion was a shower for physical education teacher Brian Becker. He wore the traditional paper plate festooned with ribbons but Ima went with this more dignified photo.